Taking a hacksaw to a brand new product might be seen as disrespectful in some professions but when you're an apprentice with BMW/Mini, it is positively encouraged. Under the watchful eyes of sensible instructors, a group of youngsters decided to turn their tools on the Mini Cooper S Paceman, hacking off the rear and transforming the playful crossover into an action-packed pick-up. The rear seats have made way for a cargo area, there's a spare tyre on the roof and it's even got a snorkel-style air intake should the Paceman pick-up be driven through streams. Mini's all-wheel-drive ALL4 technology already exists and the 180bhp turbocharged engine already kicks out significant power to take on the rough stuff, so all the students had to do was get creative with the styling. 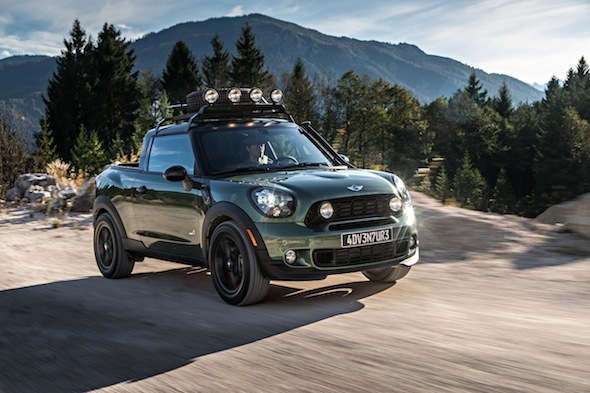 Special off-road tyres grace the chunky rims, a row of lights line the sturdy roof rack for improved visibility at night and the ride height has been increased to make sure the Mini Paceman Adventure doesn't get grounded on rocks and obstacles. Mini has stressed that this is strictly a one-off and there are no current plans to put it into production, which is a shame because we think it looks ace.